Following her interview on 5THE FM on Friday 21st February, Dr Catherine Pye addressed the meeting arranged by Millicent Field Naturalist Society and the Limestone Coast Strike Out Alliance, in Millicent. Dr Pye has lived in Mt Gambier for 23 years, has been a GP for 16 years and a Locum for 17 years, and is actively involved in advocacy for health. She said she is concerned that doctors will not know what the long-term health effects of unconventional drilling will be with in the community. The film ‘A Fractured County ‘ – An Unconventional Invasion was screened and questions were welcomed from the floor. The film featured Australians whose lives and health has been affected for ever. Creek water igniting, tap water igniting, children’s nose bleeds, and children’s skin chemical burns from bath water were among some of the adverse affects shown. Dr Pye said, “if they go ahead the landscape will change considerably. A shale gas field is a vast network of oil pads, roads, pipes, compressor stations and flair pits. Wells can be just five kilometres apart and if there are hundreds or thousands of wells across the South East it will devastate the landscape.” When asked about our farmers and their rights, Dr Pye said, ” Farmers have no rights, they can say they don’t want drilling but ultimately the farmer has no rights in South Australia.” “Fracking is a process that involves forcing chemicals underground and this is not the only concern, it is the chemicals that are released from underground too,” she said. Each drill hole uses up to 14,7000,000 litres of water and 56,800 litres of chemicals and proppants are used. The same chemicals are used for fracking shale and for coal. In a report from the United States it was reported that 944 products are used to frack, 633 of them are chemicals. Three quarters of these could affect eyes, skin, kidneys, brain and a quarter of them could cause cancer. In Australia there are about 60 chemicals used and Dr Pye said as a doctor she is concerned about what they are. “The Robe Council is supporting a moratorium and we hope that all councils in the South East will do the same,” she said. process is not an old process with years of research to show if it is a safe procedure; it is relatively new, only being used since 2007 in cluster drills. The horizontal drills have high volume, high pressure water and chemicals forced underground to fracture the rock. Loss of well integrity allows the escape of methane and volatile organic compounds such as benzine (a carcinogen) to escape into the aquifers or air. fly in fly out and so money is not often spent in the local community. btex chemicals (benzine, toluene, ethylbezine, xylene) into the air, as well as mercury, arsenic, and chromium. The USA banned flaring after January 2015.’(provided by the Dr Pye encourages communities to contact their councils and ask for a four year moratorium on unconventional drilling, to allow time for further research into the safety of this process. 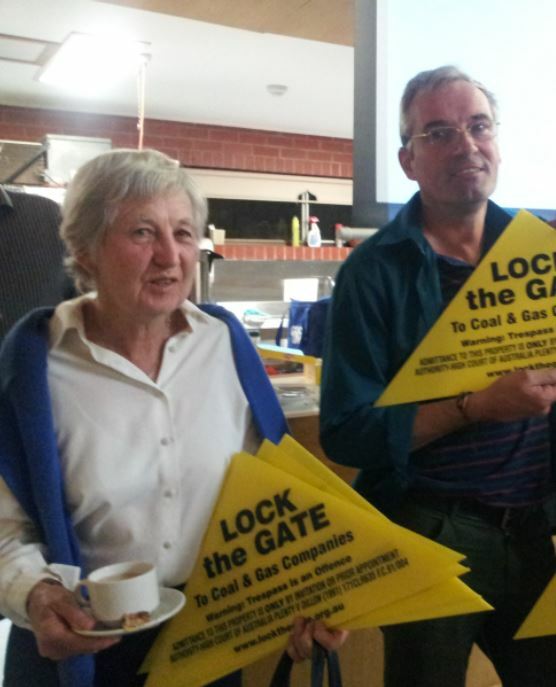 Landholders were encouraged to put ‘Lock the Gate’ signs on their gates as a peaceful non-cooperation that shows companies and the government that landholders are determined to protect their land, water and health from inappropriate mining. Two closed meetings are arranged for March 11th with Wattle Range Council in Millicent and SELGA in Penola. Representatives from Beach Energy, DMITRE, DEWNR, Anne Daw, and Dr Gavin Mudd will be in attendance at both meetings. There will be no health representation at the SELGA meeting, but there will be at the Wattle Range meeting.